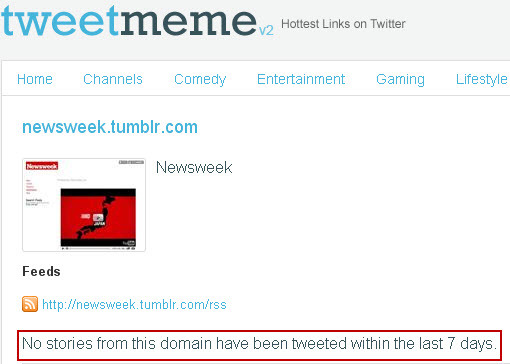 Awareness of Newsweek’s Tumblr site has been increasing of late. It’s actually been around for a while but Newsweek seems to have been giving it more attention over the past few months. I like it. The layout is clean and simple, the content is interesting and Newsweek is mixing in plenty of items from other sources. That’s critical for giving the site stand-alone value as opposed to just being a feeder site to Newsweek.com. That seems odd but it’s not just a holiday season slowdown. I went back several months and it’s not easy to find items that have gotten comments. I don’t have any data on what kind of traffic the Tumblr site is getting but either it is fairly low or visitors simply aren’t starting discussions there. 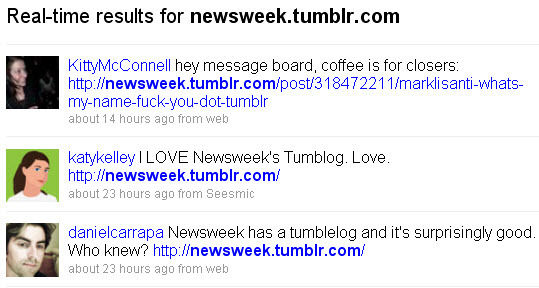 So based on just this quick look it doesn’t seem like Newsweek is getting a lot of engagement with its Tumblr site yet. 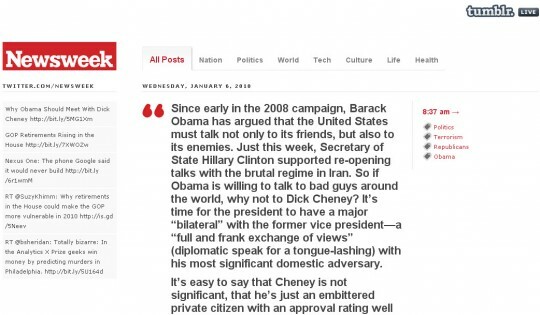 Some visitors are likely clicking through to the full articles on Newsweek.com and then commenting there and/or sharing the newsweek.com URLs which is also a good thing. But it would be nice to see the Tumblr site have a more interactive feel. FishbowlNY did a good interview with Mark Coatney, the editor who is responsible for Newsweek’s Tumblr. Is Using Facebook Comments Good for Publishers?